A former communist militant who Brazil’s new president had vowed to extradite has been detained in Bolivia, a Brazilian official said. 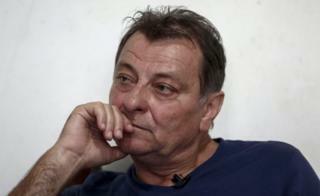 Italian Cesare Battisti is wanted for four murders in Italy during the 1970s, which he denies committing. Battisti spent years in Brazil as a refugee, backed by former left-wing President Luiz Inacio Lula da Silva. But far-right President Jair Bolsonaro, who took office on 1 January, had pledged to send him back to Italy. Filipe Martins, a senior aide on international affairs to President Bolsonaro, tweeted that Battisti “will be soon brought to Brazil, from where he will probably be sent to Italy to serve a life sentence”. An arrest warrant had been issued for Battisti in December, when Brazil’s former President Michel Temer revoked his status as a permanent resident. The 64-year-old went on the run, and both his lawyer and the police told the BBC they had no idea of his whereabouts. Battisti, who has a five-year-old Brazilian son, told AFP last year he would face “torture” and death if he returned to Italy. He was arrested by a special Interpol team formed by Italian investigators, Italian paper Corriere della Sera reports. He was wearing sunglasses and a fake beard at the time of his capture, the paper said. In December, Brazil’s Federal Police had released a picture showing possible disguises that Battisti might use. Brazilian police sources told local media Battisti was found in the Bolivian city of Santa Cruz de la Sierra. In 1979, Battisti was convicted of belonging to a far-left terrorist group outlawed in Italy – the Armed Proletarians for Communism (PAC). He escaped from prison in 1981. Later, he was convicted in absentia for killing two Italian law officials, for taking part in a separate murder, and for planning another which left the victim’s 14-year-old son in a wheelchair after a shoot-out. Battisti has admitted being part of the PAC but denies responsibility for the murders. Since his escape, he has gone on to became a successful writer of police novels. Battisti lived in France and Mexico before escaping to Brazil to avoid being extradited. He was arrested by Brazilian authorities in 2007, prompting the Italian government to request his extradition under an existing bilateral treaty. But Brazil’s then president Luiz Inacio Lula da Silva granted Mr Battisti refugee status in 2010, a move that drew strong criticism from Italy. Battisti was arrested again in 2017for carrying a large amount of undeclared cash whilst trying to cross into Bolivia from Brazil.